Justin T. Baker, MD, PhD, is the scientific director of the McLean Institute for Technology in Psychiatry and the director of Functional Neuroimaging and Bioinformatics for the Schizophrenia and Bipolar Disorder Research Program at McLean Hospital. 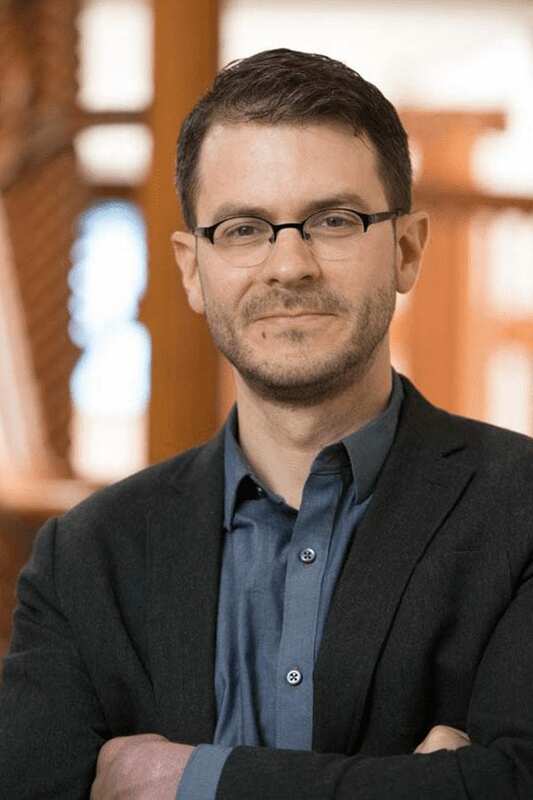 His research uses both large scale studies and deep phenotyping approaches to understand the nature and underlying biology of mental illnesses, particularly lifelong conditions like schizophrenia and bipolar disorder. Bringing people together to solve complex problems is essential for progressive change—for bridging cultures and perspectives, establishing shared vision and language between people who need help and those who may be able to provide it, and establishing enough trust among those involved that they may solve problems iteratively together, rather than returning to the comfort zones of business as usual. Solving mental health challenges through applications of technology is certainly no exception, as was evident at the second Technology in Psychiatry Summit, which took place early last month in Boston. Titled “Closing Gaps in Translation,” TIPS 2018 brought together 200–250 individuals from a range of backgrounds interested in the intersection of mental health, data science, and technology. 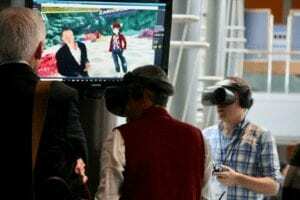 Vikram Patel (Harvard Medical School), who envisioned “A digital global mental health future,” tries a VR setup from Noah Robinson (Vanderbilt) during a break at TIPS 2018. When we talk about “translation,” we mean everything from literally translating tools across languages and cultures, but also in the sense of clinical translation: i.e., taking things that work well in experimental settings and finding ways to get them working in clinical settings. This theme of “translation” returned in several senses over the course of the two-day workshop, held at the J.B. Martin Conference Center at Harvard Medical School. The first session, “Open Access: Expanding Mental Healthcare in Diverse Communities Globally and in the U.S.,” took on technology as translational in the cross-cultural sense. Speakers including global mental health leader Vikram Patel (Harvard) and digital health pioneer David Mohr (Northwestern), gave brief remarks followed by a discussion moderated by Kim Leary (McLean) around best practices, and avoidable pitfalls, for deploying technology-based solutions to address mental health in under-resourced areas. One of the key take-home points from that discussion is that simplicity is key: most of the world still operates without a formal mental health care system, and despite rapid proliferation of smartphones and other devices in the last decade, a significant digital divide remains with respect to cost, technical savvy, and trust in technology. Many patients in the U.S. face similar issues, as the nation’s world-class services and digital health innovations are either unavailable or unaffordable in many parts of the country. Michelle Williams, The Dean of Harvard’s T.H. Chan School of Public Health, followed this session with the first of three keynotes, emphasizing that public health starts with brain health and how technology is finally starting to realize its promise to support both. The second keynote was from Sandy Pentland (MIT Media Lab), a pioneer in applying computational approaches to the social sciences, who discussed his work over the past two decades to address health and social problems at scale. A highly informative session followed on de-risking the development of digital therapeutics for mental health conditions, focusing on substance use disorders and bringing together speakers representing the Food and Drug Administration (FDA), industry, and academia. Lisa Marsch (Dartmouth) recounted developing a software tool for treating substance use that would eventually gain the first FDA authorization as a digital therapeutic “reSet” in late 2017 – i.e., how one can successfully translate an idea to a digital solution to a product that eventually reaches patients. The final session of day one returned to the translational theme, focusing on the animal-human translational gap – i.e., how to take discoveries about animals and apply them to better understand humans – and what it will take to regain momentum in the development pipeline for new psychiatric treatments. Bob Datta (Harvard) and Rogier Landman (MIT) described how machine learning is laying the groundwork for a new kind of translational scaffold based on behavior. A key take-home point from these talks was that behavioral recordings collected in a natural environment during time periods corresponding to patterns of typical functioning is extremely promising for changing how we think about finding homologies between animals and humans. Bill Carlezon (McLean) and Cameron Good (Army Research Lab) showed how the next generation of wireless implantable systems are already making such “naturalistic” experiments possible in both animals and humans, all of which led into an interesting discussion about the future of basic neuroscience, moderated by Elizabeth Phelps (Harvard). Day two began with translation in the literal sense of analyzing words and speech, in “Harnessing Natural Language for Prediction and Prevention.” In addition to technical presentations from Tom McCoy (MGH) and Guillermo Cecchi (IBM) describing “computational phenotyping” approaches (i.e., synthesizing data from multiple sources and using computer modeling to predict clinical outcomes), this session highlighted several clinical applications, including efforts to provide text-based mental health services and derive clinical alerts from analysis of words and phrases that lead to clinical emergencies in a memorable presentation from Shairi Turner (CrisisTextLine) called “Language, Data, and Saving Lives.” A related session addressed using patients’ social media feeds and electronic communications as part of routine care, which included a talk from Munmun De Choudhury (Georgia Tech) and an important discussion on how to balance pragmatic and ethical concerns in this area, moderated by Mona Potter (McLean). 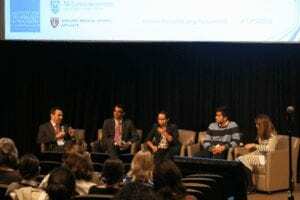 Panel discussion on the opportunities and ethical issues related to using social and electronic media in psychiatric treatment at TIPS 2018 in Boston, MA. In the third and final keynote, Bruce Cuthbert, director of the NIMH’s Research Domain Criteria unit, spoke on “Enabling Technologies: Toward Bridges Across Translational Gaps in Psychiatry,” which will redefine mental function and dysfunction in more objective, quantitatively-grounded terms, buttressed by technological innovations. TIPS 2018 wrapped up with a final session on “The Future of Behavioral Forecasting,” a meta-futurist attempt to imagine how these maturing technologies will enable more individually tailored prediction and prevention strategies over the next 2 to 5 years. While much of the near-term future of technology’s role in psychiatry remains unclear, what was apparent during the 2018 summit – just as in last year’s inaugural TIPS event – was both how quickly these technologies are improving and how critical gatherings like these are to their gaining traction in research and clinical settings. And despite the formidable work ahead before we can claim any real success in these endeavors, the 2018 Technology in Psychiatry summit ended with a sense of excitement and optimism, a renewed commitment to shared values and a palpable sense of common purpose that building a translational bridge between the tool-builders, the tool-testers, and the people for whom the tools are designed is quite possibly the translational gap we should have been focused on closing all along. Join us for the 3rd Annual Technology in Psychiatry Summit in 2019! Subscribe to the mailing list here to receive updates.